4.1 Do we need these? and we surely can't have a redlinked destination here 'W' National Park! 'W' National Park is an article that I've wanted to add, but haven't had the time to create...I have a guide book (Bradt Guide to Niger) which has good coverage of it and I hope to get around to adding some quality info to it. 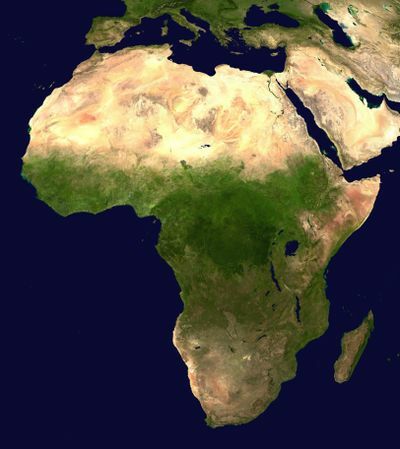 It's the best West African other destination I could think of...it has geography ranging from savannas to rainforest with plains and mountains situated on the mighty Niger River and home to a wide range of wildlife. As far as CT and Jo-burg...they're probably both in the top 5 most visited African cities (in Asia, there's Hong Kong & Shanghai both in China) and I don't have a problem with them being there since the list as it is spans every region. It was hard to pick a destination for Central Africa (I feel Zambia ought to be moved to the Southern Africa region) and went with Luanda...a fascinating city if you have the time to read about/research it, but as far as tourists go, it has next to none (besides oil-relation business travellers). I basically like the list of cities. I think there is a nice spread across the continent, and all of these are top African destination cities. If someone wanted to get rid of one, I guess I'd prefer to nix Johannesburg. It is one of the top destinations in Africa, but, to be fair, South African destinations in general are more visited than other areas, and Cape Town has a better reputation. Also, Kruger seems more important for the "Others", so if there is too much South Africa, I'd rather Johannesburg be the one to go. If we are looking for representation of each of our regions, Khartoum may be a good replacement. I think on the other list, Kruger National Park, Victoria Falls, Serengeti National Park, and Mount Kilimanjaro stand out as definitely being deserving of spots. All of these are extremely famous worldwide. That does give Tanzania 2, but it has nothing from the cities, and it's one of the top countries (and safest) in Africa. If W National Park is odd, what about Timbuktu or Agadez? They are technically cities, but they kind of seem like "Other" sort of places. I do like the suggestion of Carthage, especially since Tunisia has no city listings. If we want a real OtBP, leftfield and very unique OD - Skeleton Coast. But hardly anyone makes it there. Zanzibar merits consideration as an OD. We are Tanzania-heavy already though. Dogon Country! We still don't have an article for Dogon Country (we do on the Russian version, though, and I'll gladly get it started to avoid having a red link on the continent page). It's definitely a top "other" destination in Africa, and I definitely think it's the best feature for the Saharan region (even if it's a bit out of the desert). I would definitely trade it for W NP. Alright, Dogon country sounds better than W National Park. I've got a nice guidebook to Mali (Bradt, 2006? edition) with some good info on the area, but I'll have to dig through some boxes of books to find it. In the meantime, there is an official tourism website for Dogon Country in English! As far as Lagos & Kinshasa go, Lagos is a major city, but there isn't much in the way of things to do...it's mostly a transit hub and a place for businessmen (and recently more and more business is moving to Abuja) and oil workers en route to the Delta. I like Dakar as it's a major business AND tourist destination in western W. Africa and has tons of flights/connections to W. Africa (only Lagos has more connections). There's no need for a city in the Sahara as there aren't any major cities in the region. Bamako is only a base for flights/travelers to Mali's more famous cities and Dogon Country. Khartoum is big, but as the list is, there's 2 cities and 2 ODs in adjacent countries (Egypt, Ethiopia). I still think any cities list that excludes Lagos just looks incorrect, since it's such an important city, and because we're not just writing for sightseers (I have plenty of acquaintances who have been there for business/NGO/political work—can't say that for any of the other destinations save Cairo). But since no one seems to agree with me, please feel free to ignore that concern. I agree on both accounts (Aksum/Axum over Lalibela and Serengeti over M'Zab Valley), because they are definitely more well-known, very "African" destinations. Some of this was discussed above under "Rwanda & Burundi". 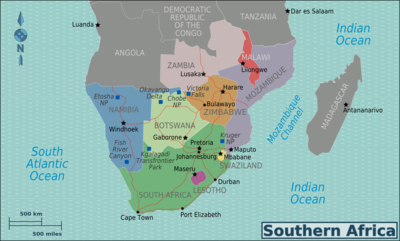 There was a discussion a while ago on the Talk:Mozambique page that Mozambique should be moved to Southern Africa and it appears as though the move was agreed upon but wasn't made. Rwanda & Burundi should be moved to East Africa as per the discussion above. Zambia also belongs in Southern Africa as it is a)economically a part of Southern Africa, b}almost all tourist traffic come from people travelling through Southern Africa. c)a former British colony much like Southern Africa (and unlike, mostly French, Central Africa), d)best reached by road/flights from Southern Africa. Zambia has very little in common with Central Africa. The islands of the Indian Ocean should be separated into their own region: Madagascar, Comoros, Mayotte, the Seychelles, Mauritius, & Reunion. These islands are similar geographically and culturally and differ quite a bit from East Africa. They mostly speak French-derived languages, are volcanic islands with lush vegetation, and most have a large influence of South Asian or Arab cultures. I support moving Mozambique to Southern Africa, don't have an opinion on Zambia. Rwanda & Burundi 100% should be in East Africa from a travelers perspective. Not in support of breaking up East Africa, I don't think it's too large, and makes sense as a travel region. Still thinking about the islands suggestion.... they don't bother me as part of east africa.... are they treated as a region? Do people often visit several of these islands from each other, or tend to travel to 1 of them only via south or east africa? I'm in agreement that a sat pic isn't ideal, since the lead image exists primarily to get readers excited about the trip (unless the place is not fun in the least, in which case an image highlighting why not to go there might be appropriate). "We should avoid links to other travel guides, to ensure we have travel information in Wikitravel, not linked from Wikitravel. This is an incentive issue; if we have lots of links to other travel guides, we lose the impetus to create our own." Have to agree with Ryan on both counts, as policy clearly prohibits the content that he removed. We are here to build our own travel guide, not to direct readers to other guides. If the Bradt guide is a great source of information, it may be worthwhile to mention that on the talk page for contributors looking to research information for the purpose of improving our guides, but it is clearly against policy to send readers away from the site for things we could provide here. This page was last edited on 31 October 2012, at 09:42.